Building a green home, ADU or renovation is an exciting project, but it can be hard to know where to start! There are a lot of different green home certifications out there, and even more opinions as to exactly which approach to green building is the most cost effective or most environmentally friendly. In this blog post we’re going to try and give a quick overview of some of the more common green building certifications that hopefully will help give someone considering undertaking a green building project a place to start. First off, why build green? While there are many reasons, generally it is either to save money on utility bills, save the earth, or both. Many green building approaches and certifications also incorporate elements of increased comfort and indoor air quality. Second, why certify? Green building certifications aren’t free, so it’s a valid question to consider if pursuing a certification is right for your project, as opposed to simply picking the green buildings strategies that make the most sense to you and using them (more on that later). Costs to certify a green building project typically include fees for 3rd party validation/inspection, extra design time for filling out paperwork, and, depending on the program, a fee for the certification itself. These costs are in addition to the design and construction costs for the green building features themselves. There are two main benefits of certification: quality assurance and communication. Most certifications both review the design produced by the architect, and inspect the construction at key moments and verify certain elements of performance, such as measuring air-tightness with a blower-door test or requiring commissioning of the HVAC system. This third party review ensures that the architect, consultants, contractor and subcontractors work is all in alignment with the requirements of the certification program. A certification also helps to quickly describe the green building features of a project, both during the design and construction process, and down the road if the home is sold. With that context in mind, let’s dive into some certifications. While LEED is perhaps better known as a commercial building certification, they certify homes as well. LEED is a holistic, points based certification, where you get points for green building features including better energy efficiency, reduced water use, use of recycled or sustainably grown materials, use of non-toxic materials, among a variety of other options. Different levels of certification (silver, gold, platinum) are given depending on how many points you score. This can allow for a lot of flexibility in how you achieve your rating, but can also create a lot of paperwork and extra design time spent trying to optimize the points system. LEED for Homes also includes verification by a 3rd party rater. Earth Advantage (EA) is another holistic program, somewhat comparable to LEED, but it is a local program based in Portland, OR. Some potential advantages of Earth Advantage include that it’s local, so it is tailored to the particular climate and standard construction practices of the PNW, it’s potentially cheaper to certify an EA project than a LEED project, and they have a lot of marketing materials available for production and spec home buildings using their certification system. In addition to providing their own Earth Advantage certification, they also provide support and verification for a variety of other certifications such as LEED, ENERGY STAR, Indoor AirPLUS, WaterSense, and PHIUS+. The requirements are different in different climate zones, but typically result in a much higher performance home than would be required by a certification like LEED. Characteristic features of a passive house project are thick, super-insulated walls, high-performance windows, and the use of a heat-recovery ventilator which takes the heat from air exhausted from bathrooms and kitchens and uses it to warm up the fresh air delivered to bedrooms and other living spaces. In addition to significantly reduced energy use, PHIUS+ certification also provides a high level of thermal comfort, with warm surfaces and no drafts, a durable building, and high indoor air quality. While both the improved thermal envelope and the additional design and certifications costs of a Passive House are not insignificant, they are somewhat offset by both a reduction in need for large and expensive HVAC systems and of course by lowered monthly utility bills. While passive house certification is about as good as it gets when it comes to energy use, it doesn’t say anything about other aspects of green building, such as sustainable building materials, water use, etc. And a passive house sidenote: there is also the European Passivhaus Institut with it’s own certification, with a slightly different philosophy, and much debate as to the relative merits of the two programs is out there if that’s the sort of thing that gets you going. Homes certified through the Department of Energy’s Energy Star program are in theory only a little bit better than code minimum homes, but one of the perhaps less obvious values of Energy Star certification is that the 3rd party inspection enforces elements of the national building codes that are often either not required or not enforced in local building codes. For example, the International Residential Code required a blower door test to validate air-tightness, but the Oregon Residential Specialty Code does not require a blower door test. By requiring a blower door test, the Energy Star program is requiring certified homes to be significantly more airtight than the Oregon building codes do. Although the improvements required by Energy Star may not be very dramatic, neither are their costs. The Energy Star certification is designed to be cash-flow positive, which means that the decrease in monthly utility bills is greater than the increase in monthly mortgage payments required to achieve the certification. The DOE publishes a document of their cash-flow calculations here. Net zero isn’t a specific certification, but rather an approach to energy efficiency. There are a variety of ways to define net zero, but the simplistic definition is a home that produces (through solar panels) as much energy as it uses over the course of the year. Typically, during the summer a home may produce more energy than it uses, and sells that energy back to the grid, and in the winter will consume more energy than it produces. There are a variety of organizations that certify net zero homes, such as the DOE’s Zero Energy Ready Home, the Living Building Challenge’s Net Zero Energy Building, Earth Advantage’s Net Zero certification, and PHIUS’s Source Zero certification. The Pretty Good House is not a certification, but rather an approach. The Pretty Good House approach advocates a much better than code house, employing best practices for insulation, air-sealing, sustainable resource use, durability, and comfort, but because it isn’t a specific standard, it allows considerable flexibility for the unique constraints of every project, whether they are based on budget, existing conditions on the site, or local construction practices. “Pretty Good House” is a great search term to google, and there is a wealth of information on http://www.greenbuildingadvisor.com/ about the Pretty Good House approach, both in their blog posts and in their Q&A forum. Because of this flexibility in design parameters, a successful Pretty Good House project requires good collaboration between the owner, architect and contractor to make sure that everyone is working with a shared definition of what a Pretty Good House is. These are just a few of the many certifications and approaches out there. If you’d like to talk about what approach to green building aligns most with the goals for your project, drop us a line and we can chat! 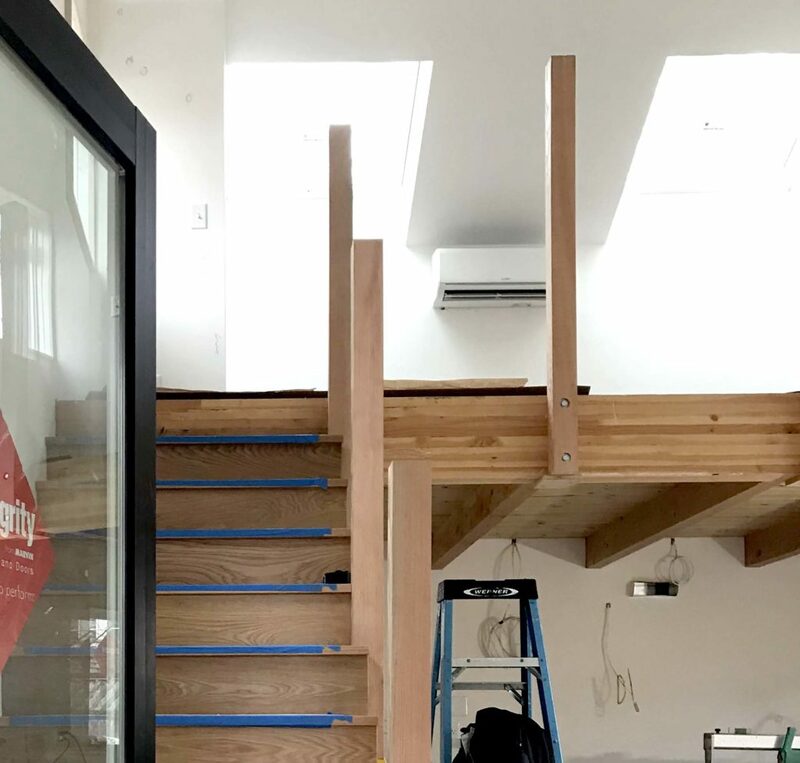 Construction has just wrapped up on the Marguerite ADU, contemporary accessory dwelling unit we designed in Southeast Portland. In this post we’d like to share the design and fabrication process used in making the guardrails at the stair and loft. Being makers—in addition to designers—was a lot of fun, and we’re really excited about how the project turned out! 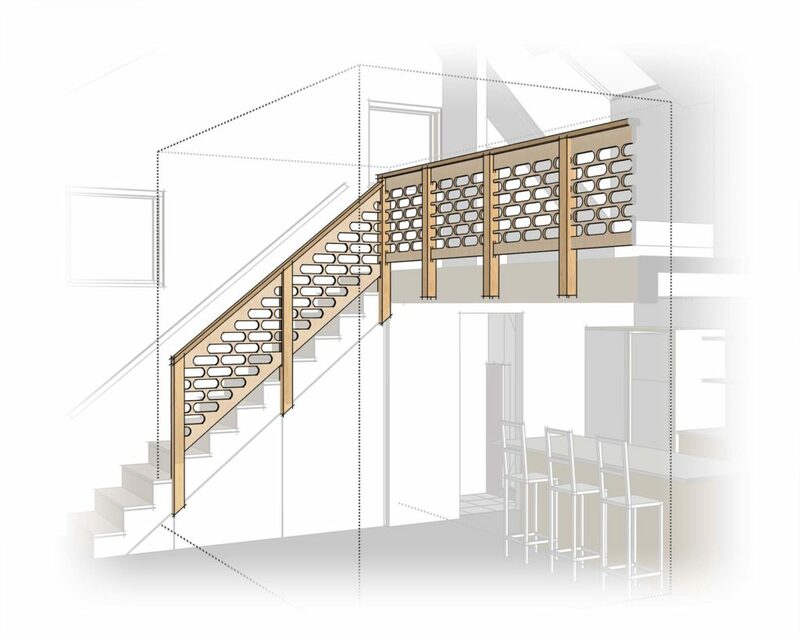 Stair railings are a great place to get creative. While they have some basic functions they have to perform, like keeping people from falling off the stairs, they present the designer with a wide wide variety of aesthetic and material possibilities. Because this ADU is primarily one large room, the guardrail serves the additional role of being a partition between the living and sleeping spaces. We wanted a design that was both unique and substantial. 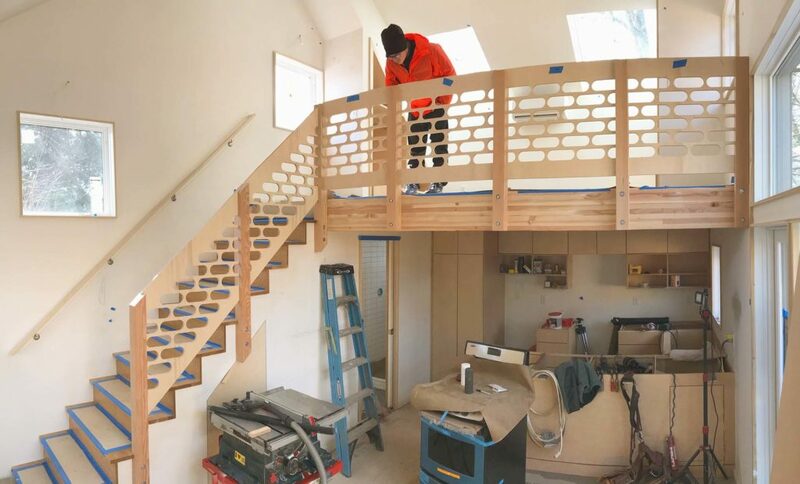 The idea to use a CNC milled plywood panel came pretty early in the design process, but the details of both the pattern and how the guardrail would be constructed continued to evolve through the design process. Initially we were planning to mount the panels to the faces of the posts, but were torn about which side of the posts to mount the panels on. In the end, we decided to mount the panels in grooves cut into the posts so that they would be symmetrical on both sides. When it came time to make the panels, we decided to hire the ADX fabrication team to do the CNC milling and some of the rough woodwork. We would then put some finishing touches on the components in the office and would work with Right Arm Construction, the project’s general contractor, on the installation of the panels themselves. Right Arm temporarily installed uncut versions of the vertical posts, and precise measurements were taken so the panels could be fabricated to the correct size. 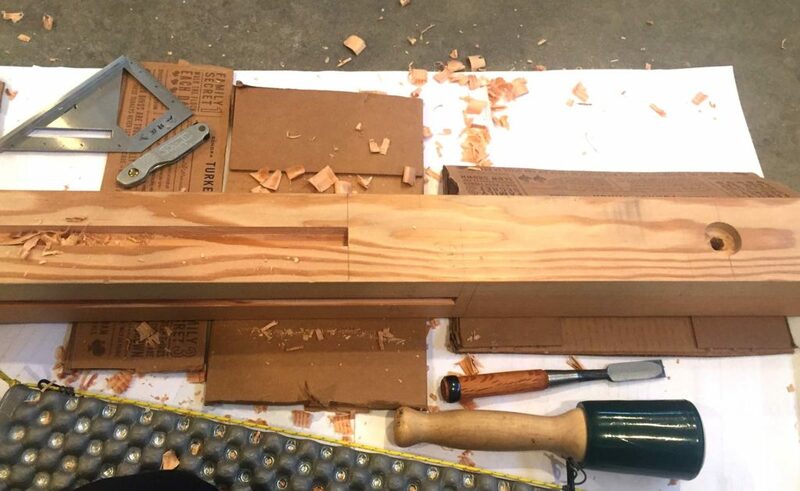 While we had a very accurate 3d model of the design, the tolerances on the panels fitting into the grooves were tight enough that we knew we couldn’t just rely on the dimensions in our model—we would have to measure the as-built conditions before cutting the panels. 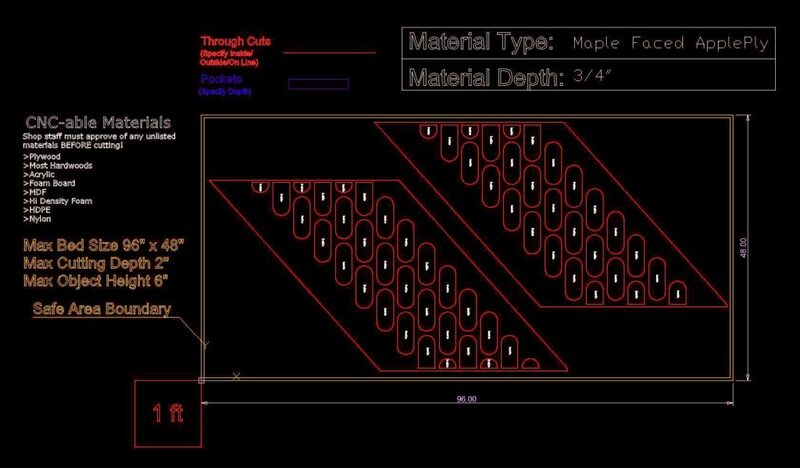 After measuring the posts, we translated the design into a 2d CAD drawing that incorporated the as-built conditions, did our final tweaks of the pattern, then prepared the files that ADX would use to cut the panels. After the posts were measured, they were dismounted and taken to ADX so the grooves could be cut on their table saw. We had them stop a little short so we could finish the ends of the grooves by hand, getting them to precisely the right length. Once the pieces were all set, we took everything back to the sire for a test fit of the panels. It was good thing we did, as two of the panels needed to be remade for a perfect fit. After recutting those panels, and a second test fit, we handed off the panels to Right Arm, who finished the installation. It looks pretty sharp, if we do say so ourselves! We’re excited to do more of this type of work, where we get to get our hands dirty making custom design elements. 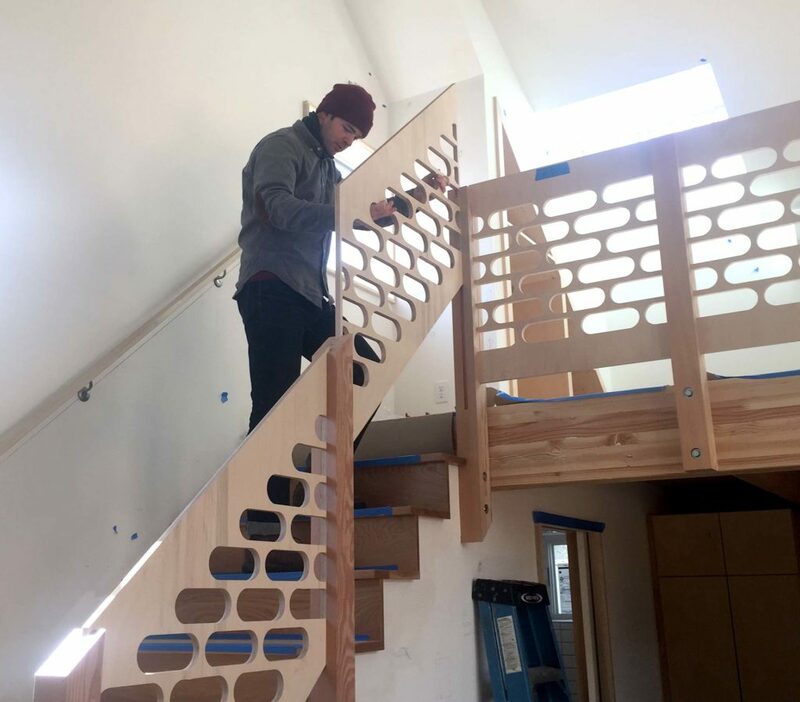 Overall the process was quite successful, though there were some challenges involved in coordinating the offsite fabrication of the panels to fit perfectly with the site-installed vertical posts. Next time we’ll work towards something with an equally compelling design, but with a more forgiving installation process.